Israel marks 1,600 days of Gilad Shalit’s captivity, his mother says PM must “make a courageous decision.” Netanyahu: Hamas’s price is too high. 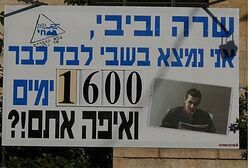 The family and friends of Gilad Shalit commemorate today 1,600 days of his captivity amidst Hamas terrorists. His mother calls on Prime Minister Binaymin Netanyahu to “make a courageous decision” and agree to the price set by Hamas for his release. Netanyahu has said that the price—freedom for 1,000 imprisoned terrorists as well as all female and teenage terrorists—is simply too high. A leading terrorist who was once arrested in hopes of enticing Hamas to free Shalit has been arrested again. Palestinian Authority sources reported that the secretary-general of the PA Legislative Council, Mahmoud Al-Ramhi, was arrested on Tuesday, as part of a wave of 11 arrests made by the IDF in Ramallah. Al-Ramhi, a leader in Hamas, was arrested in the past following Shalit’s abduction in June 2006, and was held for two years in hopes that his imprisonment would speed up Shalit’s release. Hamas has refused to allow even neutral observers, such as International Red Cross representatives, to visit Shalit throughout the 52 months of his captivity. Human Rights Watch (HRW) has condemned Hamas, calling its treatment of Shalit as “cruel and inhuman” and saying it illustrates the UN definition of torture. HRW also said Hamas is in violation of the international rules of war by prohibiting him from having contact with his family or visits from the Red Cross. Shalit was in his tank on the Gaza border when he was captured by Hamas terrorists who had tunneled from Gaza to Israel. Two other soldiers in his tank crew were killed: 2nd Lt. Chanan Barak and Sgt. Pavel Plotzker. Shalit was taken to Gaza, and his whereabouts have never been ascertained. Contact with him since then totals the following: He has apparently received one letter throughout his time in captivity, three letters have been received from him, a tape of him reading a letter aloud was released in June 2007, and a videotape of him reading another statement was released in September 2009. Four cities around the world – Paris, Rome, Miami and New Orleans – have granted Gilad Shalit honorary citizenship. The tent erected in Jerusalem near the Prime Minister’s residence will be lit up today and tomorrow in an extra-special manner to commemorate the 1,600th day since Gilad’s capture. In addition, a rally is scheduled to be held in Washington, D.C. today demanding that Hamas release its prisoner; 1,600+ people, including Ambassador to the U.S. Michael Oren, are expected to be on hand. Gilad’s mother Aviva Shalit wrote a letter to Prime Minister Binyamin Netanyahu for the occasion, pressuring him to “wake up” and make the “courageous decision” to respond positively to the Hamas demands for her son’s release. Hamas demands the release of 1,000 terrorists imprisoned in Israel, as well as freedom for all female and under-age terrorists similarly incarcerated.